The DM’s map is a mixture of the fearsome and the fanciful – I’ll let my reader decide which are which! And we mustn’t be surprised. I mean, the millennia of empire bred colonial revolutions and the modern political landscape is no different. Ordinary folk do not accept their heritage being ignored. At the personal level, a man has his pride and his dignity and can no longer be cowed into submission by the rich and powerful. But it ain’t that simple, eh? In Scotland and Catalonia the polls reveal as many citizens being con as pro independence. And would-be-renegade states cannot offer a successful economic future without political compromise. By the way, when was the last successful ‘flounce’ of this kind? ” when was the last successful ‘flounce’ of this kind?” I think that might depend on what you mean by success, but South Sudan is the last country to have broken away. Support for “independence” in Scotland has imploded, apparently. Simon, er, why? The named areas are trying to flounce. I have personal familiarity with only one place that might be considered to be in such a situation. That’s Puerto Rico, where the population (the poor hurricane-wrecked sods!) is more or less neatly divided into three groups: those who favor the status quo (Commonwealth status with the USA), those who want total independence and those who will settle for nothing less than full Statehood. Lacking current “official” figures and my friend Tomás, my best ground-level source of local information, having died, I’d venture that the independence lot are still in the minority, no doubt because most people have figured out how few USA dollars that would leave them, and that the status quo bunch remain on top. Cog: By the 1930s most Philippine elite types were content with Commonwealth status. They largely ruled themselves and the Americans only looked after their foreign affairs and defence. They did rather well out of it. They moved to full independence only because of electoral necessity. Recently it seems as if a majority of Puerto Ricans voted to push for statehood. We’ll see how that goes. Wouldn’t it be loverley (c. Elize Dolittle) if Bavaria seceded? That would wake up a few sleeping dogs. Beg pardon, but I beg fundamentally to differ. In the McReferendum, the Jockanese voted 55.30% to 44.70% against independence, whereas in Catalunya the vote was 92.01% to 7.99% in favour of independence and in the UK referendum the vote was 52% to 48% in favour of leaving the EU.. Hardly the 50/50 stalemate you infer, unless you are a die-hard remoaner for whom democracy only applies if the result is the ‘approved’ one in your righteous, liberal opinion. At some point the various establishments, be they in Holyrood, Westminster, Madrid will be obliged to respect the democratically expressed wishes of that electorate even if it derails the Establishment’s wider master plan of subservience to the EU project and the rule of the unaccountable (both democratically and financially). By the way, I await in forlorn expectation that the English electorate will be consulted on any of these or other matters that may concern them, at least before England is broken down into subservient regions accountable only to the likes of Drunker, Barmier and that little speccy Belgian type. Janus: Germany would turn into Italy overnight. Bavaria provides virtually all Germany’s economic cushion. OZ: Except that Scotland’s vote was legal, as was the Brexit vote. The vote in Catalonia was boycotted by supporters of union with Spain, was marred by irregularities on all sides and was done in defiance of Spain’s constitution. Madrid can in no way countenance that vote in Catalonia. If anything, Catalonia would — if it proceeds — be turned into Spain’s only directly-ruled province and it would lose all autonomy. This has nothing to do with the EU and everything to do with the criminality of the Catalan government. OZ; you are right; my general observation needs some detail. In Scotland a ‘close thing’ is now probably a ‘no thanks’. In Catalonia, the only peopew who turned out were for ‘yes’ – 57% staying away. Btw, I’m a Brexiteer.! But…………as OZ implies, the big flounce, not yet complete, is Brexit. I quite like the idea floated today in the Indy that it’s best to give the negotiator rôle to Boris; killing two birds, as it were: calmingTory strife and putting the bejasus up the EU team. No one has mentioned the American Civil War which is the example of how things can get totally out of hand. The Constitution does not directly mention secession. The legality of secession was hotly debated in the 19th century, with Southerners often claiming and Northerners generally denying that states have a legal right to unilaterally secede. The Supreme Court has consistently interpreted the Constitution to be an “indestructible” union. There is no legal basis a state can point to for unilaterally seceding. Many scholars hold that the Confederate secession was blatantly illegal. The Articles of Confederation explicitly state the Union is “perpetual”; the U.S. Constitution declares itself an even “more perfect union” than the Articles of Confederation. Other scholars, while not necessarily disagreeing that the secession was illegal, point out that sovereignty is often de facto an “extralegal” question. Had the Confederacy won, any illegality of its actions under U.S. law would have been rendered irrelevant, just as the undisputed illegality of American rebellion under the British law of 1775 was rendered irrelevant. Thus, these scholars argue, the illegality of unilateral secession was not firmly de facto established until the Union won the Civil War; in this view, the legal question was resolved at Appomattox. Incidentally John Harington was a plumbing pioneer having been credited with the invention of an early flush toilet. The double standards of the US is demonstrated by the secession of Texas from Mexico and its annexation by the Union which led to war in 1846. The Republic of Texas successfully seceded from Mexico in 1836 (this, however took the form of outright rebellion against Mexico, and claimed no warrant under the Mexican Constitution to do so). Mexico refused to recognize its revolted province as an independent country, but the major nations of the world did recognize it. In 1845, Congress admitted Texas as a state. The documents governing Texas’ accession to the United States of America do not mention any right of secession—although they did raise the possibility of dividing Texas into multiple states inside the Union. Mexico warned that annexation meant war and the Mexican–American War followed in 1846. But US duplicity has never really been in question beginning with the factors leading to the Revolution and Declaration of Independence and its subsequent expansion west and leading to the subjugation and genocide of indigenous inhabitants, while its colonial ambitions in the Philippines and Cuba further demonstrated the hypocrisy of the Land of the Free. This is not an anti US rant, just an observation that she is no better than she ought to be! In my opinion, there isn’t a snowballs chance in Hades of an agreement being made within the proposed timescales. May must know that she will have to walk away with no deal or ignore the result of the referendum by hiding behind a “…..therefore I have concluded that until we are able reach a properly negotiated trading agreement, that it is in the best interest of the country to temporarily remain in …… ” speech. I’m afraid that I have always had a sneaking suspicion that she has always favoured the latter rather than the former as a final result and that is precisely what she is intending to achieve. Maybe she thinks that she will be able to retain power by being able to point the finger for the lack of any such agreement solely at the intransigence of the likes Barmier and Drunker while she and her cronies have, very openly been seen to have tried their very very very bestest to carry out the sovereign will of all you wonderful British people. Could that possibly be the reason why the details of the negotiations are now being aired so publicly when the parties originally agreed to keep them all private? Could it be that May can now openly blame the Commission for the impasse and the Commission can equally openly blame the UK? Hey, everyone needs a scapegoat now and then, don’t they? Move along now, nothing to see here, just someone trying to refill a train with more gravy. James, I’m marginally less pessimistic. The usually reticent Danish Finance Minister now says the EU stance should be more positive and open to compromise with the UK. He’s aware that a bad deal for the UK wpould be a bad deal for UK-Danish trade. A bad deal for the UK would be a bad deal for everybody. Except Brussels who are only concerned about keeping their precious political project on the rails regardless of the misery it will cause. Totally agree Jazz. The only part of the EU that will not be effected because it doesn’t rely on trade for it’s income, is the the EU itself. Most of the population of Europe are aware that we all benefit from a free trade area, that’s why the common market came into being, but if the price of Louis wanting to buy my turbot or the price of me wanting to purchase a car from Otto is that we have to give up control of our borders, accept that our courts are no longer in charge of our legal system and bow down to a government that is so ineffective that it can’t even decide on a permanent site to operate from, is in my opinion a price too high to make it worth while. Just watched May say the ball is in the EU’s court – and the EU saying that it’s in the UK’s. Well, didn’t we all know that the EU would do anything rather than allow the UK to depart amicably? I suspect that Britain will have to leave without a deal, before the idiot EU negotiators finally recognise that some people / countries really do have lines beyond which they will not be pushed. And that it is not in the best interests of the rest of Europe (i.e. the people they are supposed to be representing) not to make a reasonable settlement. Hey James! I agree with your sentiments. I’d hate to see the Houses of Parliament turned into a museum for the oldest long-lived democracy. For me – all I want is a new, blue British passport. Ms May is already preparing White Papers for a no-deal result. I think Boa is right. Our red line has already been threatened. Time to fight. The EU response to May’s ‘ball’ comment shows a typically ignorant awareness of English idiom and attitudes. The above map didn’t include WA’s desire to leave Australia…… twice attempted I believe, including a referendum in 1933. Canberra says ‘no’ of course due to all those lovely minerals and other goodies, but soon one will be able to fly direct to Perth from London, so who knows what’s around the corner! Especially with the decision to remove the Western Force from Super Rugby, I wonder whether the latest secessionist movement will gather pace. Flippancy aside, money talks and as such nothing much will change within in the EU. Look how South Sudan has failed in quick time. 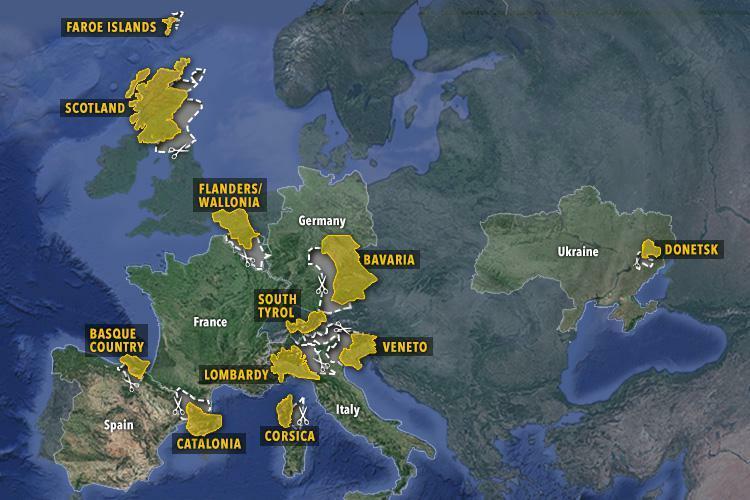 Catalunia and the other smaller regions in the map above simply can’t afford independence. The sooner their pollies get a reality check, the better for everyone. I voted remain, but I don’t moan about the result. However, I suspect post-brexit the average UK and EU citizen really won’t notice much difference in their daily lives. What annoys me is the fact that so much governmental resource and money is being spent on brexit, whereas other more important issues requiring legislation and governing matters are being ignored, left aside or put on back-burners lit by candles. Hurrumph. C426, I expect Boa will soon reply on behalf of the Antipodes. Meanwhile, I don’t know what is being spent on Brexit or what is being postponed by way of normal business. Do you? Janus, indeed Boa will I’m sure! No, however I do have first hand experience of legislation that is being put on hold due to most of the Home Office lawyers being moved to deal with Brexit. I’d imagine a whole new Governmental Department isn’t cheap either. Gee thanks Cuprum! I actually think you have a far better grasp on what’s happening in West Australia (WA) than I do. I had to look it up! So you are welcome to correct me if I’m wrong. It would, indeed, appear that some in WA are looking for a ‘Waxit’… (doesn’t sound very inspiring, does it? But at least those in WA suggesting secession realise that they would need their own currency and would have to fund their own services and projects. They do not have that sort of money now the mining boom has gone – and I’m not too sure they would have had enough when they were riding high. I really could not believe how many Scottish Independence Voters thought that they could continue to use the financial backing of the UK to support Scotland if they voted for independence. I’m sure you are right Cuprum, a lot of legislation is on hold – but does it really matter if, at the end of the day, Britain can legislate what it wants – rather than what a load of outsiders want?